C. L. Schneider is a New York-based author of adult epic and urban fantasy. Born in a small Kansas town, she grew up in a house of avid readers and overflowing bookshelves. Her first full-length novel took shape in high school, on a typewriter in her parent’s living room. With a passion for dark stories full of action, suspense, and emotional conflict, Schneider creates complex characters and vivid, fantastical worlds. Her epic trilogy, The Crown of Stones, tells the story of Ian Troy, a man born with an addiction to magic. 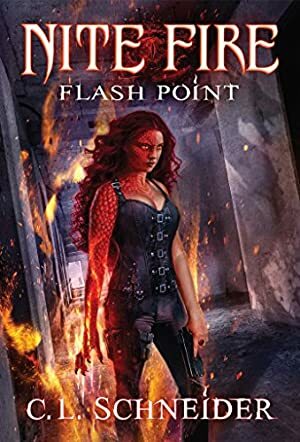 Flash Point is the first book in her new urban fantasy series, Nite Fire, featuring shapeshifters, dragons, and parallel worlds. Learn more about C.L. Schneider and her work at clschneiderauthor.com where you can read reviews, excerpts and sneak peeks, and subscribe to her newsletter. An active part of the indie author online community, you can connect with her on Twitter, Facebook, Goodreads, and Google+, where she is often found chatting about books, zombies, coffee, and the daily ups and downs of a writer’s life. Prepare to be sucked in by this gritty, dark, urban fantasy. Filled with mystery, danger, dragons, shifters and all manner of intriguing fantasy creatures, Nite Fire: Flash Point by C.L. Schneider is one helluva ride! Dahlia Nite has secrets, but her deceptions are necessary. After fleeing her home in disgrace, Dahlia lives in the human world in her human form, taking contract jobs and protecting humanity from the magic all around. With a death sentence hanging over her head, the human realm is a safe haven from her fellow lyrriken shifters. Homesick for Drimera, she knows she can never return. But when her one remaining Drimeran contact, Oren, puts her onto a case with obvious lyrriken involvement, the past she has spent nearly a century outrunning looks to be catching up with a vengeance. Nite Fire: Flash Point has everything an urban fantasy should: action, danger, a well formed mythos, interesting creatures with diverse powers, and a hero you can get behind. In Dahlia Nite, C.L. Schneider has created someone special. She's tough, conflicted and smart, with a dark past casting shadows on her every action. Pulled deeper and deeper into her investigation, readers get to witness the aloof shifter draw close to the humans around her, possibly developing the first real friendships in her long existence. But what price will she pay for these connections? And can her new friends accept the truths hidden in plain sight? Nite Fire: Flash Point by C.L. Schneider is full of action and intrigue, a must-read for lovers of urban fantasy, and an addictive start to a series. C.L. Schneider is one of the best fantasy authors I have ever encountered! Her writing is vivid and easy to follow. I highly suggest any of her books!